Anne began teaching at the MU Sinclair School of Nursing part-time in 1983 as an instructor of clinical nursing in the undergraduate program teaching nursing of women and newborns. 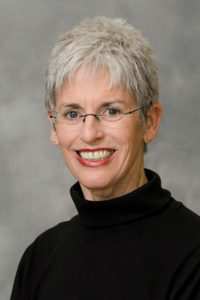 She joined the faculty full-time in 1993. Prior to teaching at MU, Anne worked in various intensive care units (SICU, NICU, Peds ICU, Thoricic ICU) and was a camp nurse in Bemidji, Minnesota after taking an Emergency Medical Technician course. At the School of Nursing, Anne has served on the following committees: Curriculum; Student Admission and Progression, and Appointment (serving currently), Promotion and Tenure. On campus, she has participated on the Computing in the Curriculum, the MU Campus Disabilities Awareness Committees and Campus Study Abroad Advising Council. Anne also is the faculty advisor for the Nurses Christian Fellowship, is the Wellness Ambassador for the School of Nursing, and the Scholarship Chair for the UG Program. Anne enjoys helping out at the various activities on campus for students as well as the community at large. She rides her bike to work and recreationally for fun and fitness.